I think it does work better straightened and it matches the other large paragraphs in the story. I still kept the same colour as it fits in with the colour palette of the illustrations which is very natural and nature themed. Originally I was trying to capture the Stoat’s weird way of attracting their prey and killing it, as they tend to distort and twist their body. However, now looking at the new design I can see why some viewers would have found it hard to understand what he was doing and where his limbs began and finished. 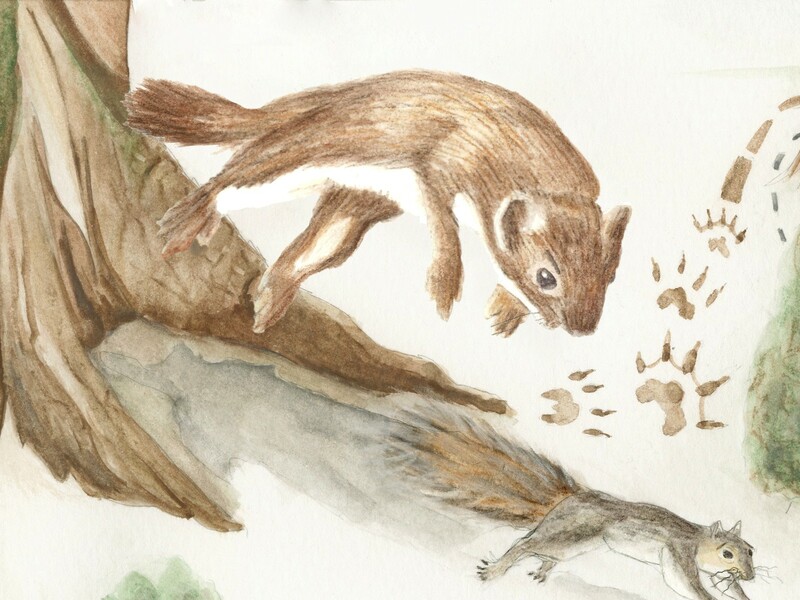 A much cleaner illustration of him jumping onto of the squirrel although I feel he doesn’t sit perfectly into the scene as the original as I have had to paint him separately then place him on top. Agin if I had more time I would refine the illustration. Instead of using a set type, I used one of the hand drawn noises from within the book and placed it on the front. I think it looks a lot better and is more natural with the surrounding illustration. Here is the alteration to the end pages. I needed to incorporate more educational information in about the animals as it was mainly the illustrations showing the unusual creatures but to much type to explain what they are. So for the first end page I cut the original acorn scene in half and placed an activity game for the reader to complete. It also hints of what may be coming but still doesn’t give the story away. For the end page that is going at the back I created the same layout by cutting the original scene in half and add a information page about specific animas in the book. I would love to have added more pages but I was a my 32 page limit and so I decided to place another activity in there by asking the reader if they could find any information about the stoat. This would hopefully kick start their interest in nature and the woodland. For the sounds in the woodland I originally used the font that I used for the narrative and I liked it but it was suggested that I should hand draw the sounds like I did with the main sounds as it created more movement and depth. I struggled doing this as the images became pixelated when I reduced them in size or they were so fine photoshop couldn’t pick them up even though I scanned them at various dpi. Anyway, I eventually got there and some are handwritten and some I have used the font as they were clearer compared to by design. I did change the style slightly so it’s not purely the same text and I think it works. I also moved the main text to the opposite page as it was hard to see on the branch on the left side. Overall I think these tweaks have improved the book slightly and I am sure I could spot many more that I would love to correct however, I have ran out of time. But this does not mean this specific book is finished and I will improve it once the module has been finished. I will then hopefully send it to the Macmillan children’s book competition and possibly to potential publishing companies. Also I will be able to get my feedback from the questionnaires that I sent to a few primary school teachers and use their comments to improve and push the book further. This entry was posted in Changes to my work. The last concept panel is here and I was nervous as I had worked so hard I didn’t want to get shot down. I admit I have become protective of my work and want it to be perfect and everyone loves it but I know this would not be the case as I can see areas where there is potential improvement. There should be a page in the back where it illustrates some facts about the added animals e.g. the Spider and Weevil. This is so it interlinks with the book more and learn about the other animals as well as enjoying the story. Some images are too full and could be taken back and be more intense. Some of these comments I would struggle with as the time is dwindling away to a week until hand in. For example, taking out the Stoat I would have to reconsider the storyline as it wouldn’t flow as well and would need a scene to bridge the gap. I could consider this in the future but for now I could take it out and ruin what I have already done. Plus I think the Stoat works as he is another unusual character that adds a sense of danger to the adventure. 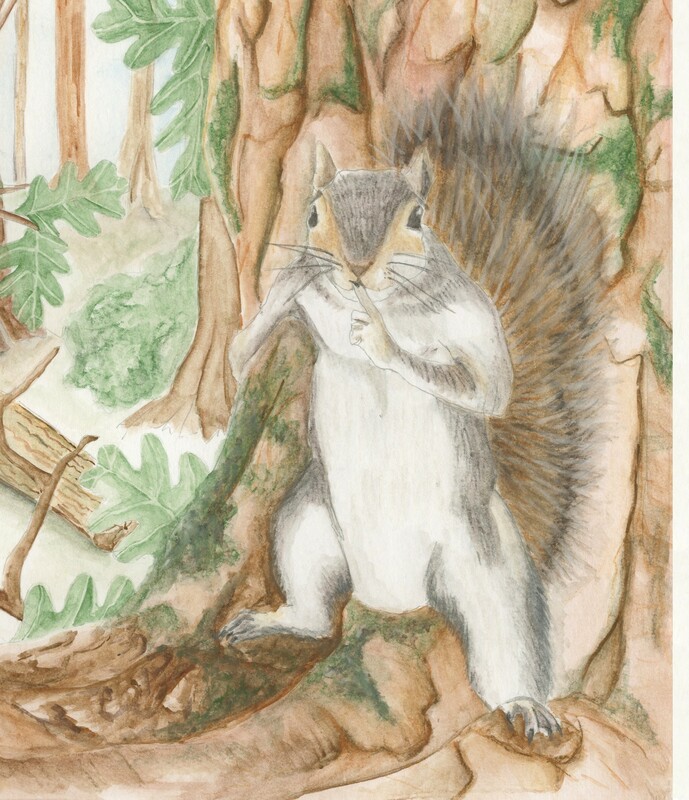 He is the one who makes the squirrel realise it’s his stomach that is making the scary grumbling noise. To look at the book through the eyes of not seeing it before, see if the story is easily read. I better get cracking then! This entry was posted in Concept Panel. 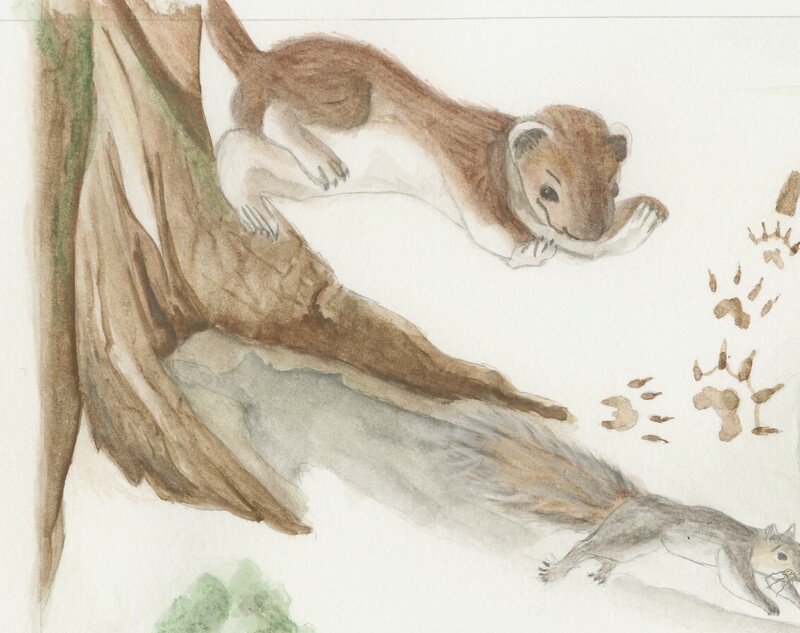 In this scene the squirrel is hiding from the Stoat and the Stoat has no clue where he has gone. 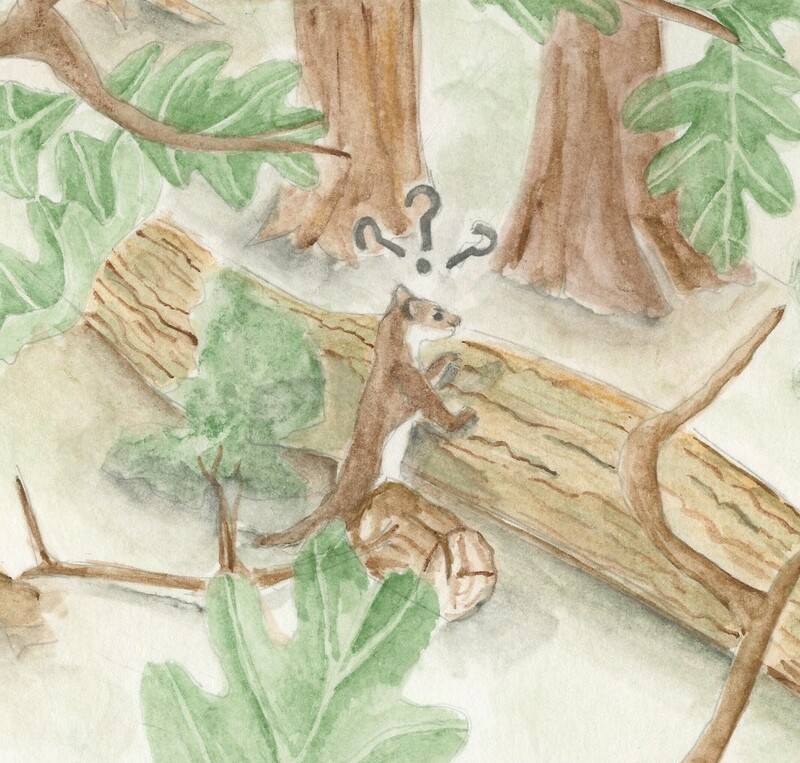 So instead of writing a sentence explaining the scenario, I placed three question marks over the head of the Stoat and positioned the squirrel in the foreground hiding on a tree shushing the reader. The reader can clearly understand that they need to be quiet and so the Stoat doesn’t realise where the squirrel is and can get away. I think this works much better and proves that you don’t always need text to explain the scenario. This entry was posted in Text extension. Each book had a different style but I felt that they would work best. It looks like a set typeface, I tried to search the name of it but could not find it. Anyway, it is clear and precise with the excitement of the flicks and curves of the style suiting the storyline. Some speaking parts are set in italics so the reader can differentiate between who’s talking. As my book only has one talking character I could place their speech in italics and so the reader will know when it’s speaking and when it’s the story and may be inclined to put a voice on for the character. A different style, looks more hand written which I like as it interlinks with the illustrations. Very few words explaining the scene and it isn’t in a grid, straight line system which allows it to breath and float along with the illustrations. The text content is exaggerated with the size of the font and positioning e.g. 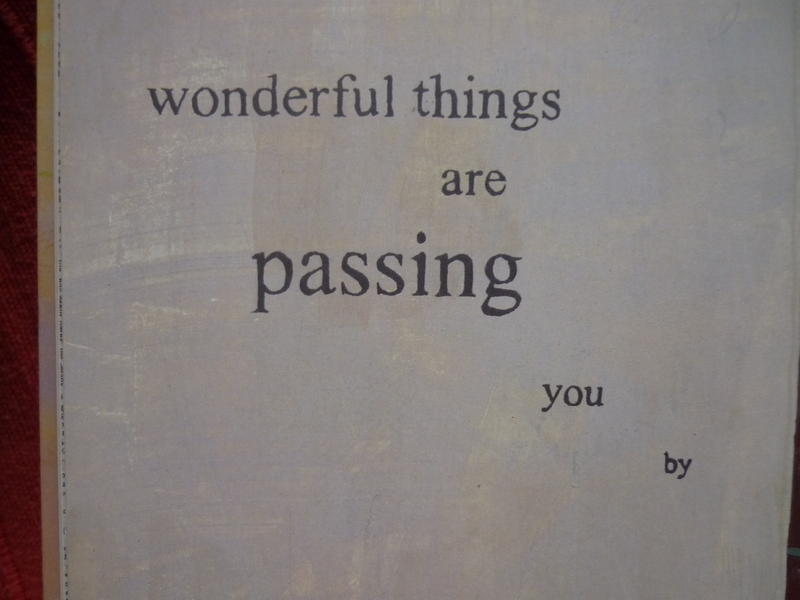 this image makes you say wonderful things in a happy tone but as you carry on the sentence your voice drops and becomes quieter like it is disappearing into the distance. I think I would like to incorporate that into my scenes, allowing the reader to exaggerate the sounds of words preventing the narration to be a monotone speech. Again another text that looks hand written, looks like it has been carved into the page. All the text is uppercase and when speaking to a primary school teacher she commented that when the children learn to read they are learning about punctuation, upper and lower case letters. If I chose this style and kept the uppercase letters it may confuse the reader or it may be hard to read as I would have more text than this example. Also, this type suits this style of illustration whereas it may look clumsy with mine. So why did I pick this, well I just liked the hand written factor and that the text isn’t white or black, its yellowy cream which softens the appearance. I must consider this when typing my text. It blended in beautifully, and I chose to not use black as this would be too harsh against the soft illustrations. So I chose a colour from the actual illustration which was a lightish brown, now it interlinks perfectly. When positioning the text I made them follow the wobbly borders of the illustrations and so it flowed but when it came to larger paragraphs I placed them on straight. 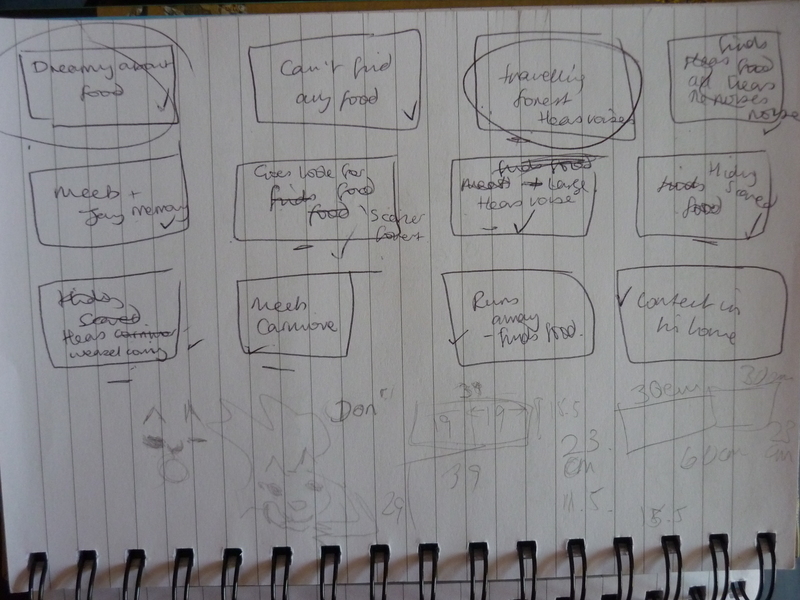 This is so it didn’t look like I just plonked them on the page without considering the flow of the scenes. The scene below shows text in the trees, and I have emphasised some of the words and positioning of the letters to allow the reader to experience the feel of the word when reading it. For example, squeeeak I have made the s small, increasing the letters in size emphasising the noise is becoming louder. I have also italicised a few words within the main text to highlight certain strong feelings e.g. he felt even more hungry. To show he isn’t just a little hungry, her is excruciatingly hungry. Overall I am happy with the outcome of the text as I was worried that I would not be able to pull it off s I have struggled in the past. I would definitely consider using more time when incorporating text and experiment more with colours, style and positioning but for now I think this is a good base template. 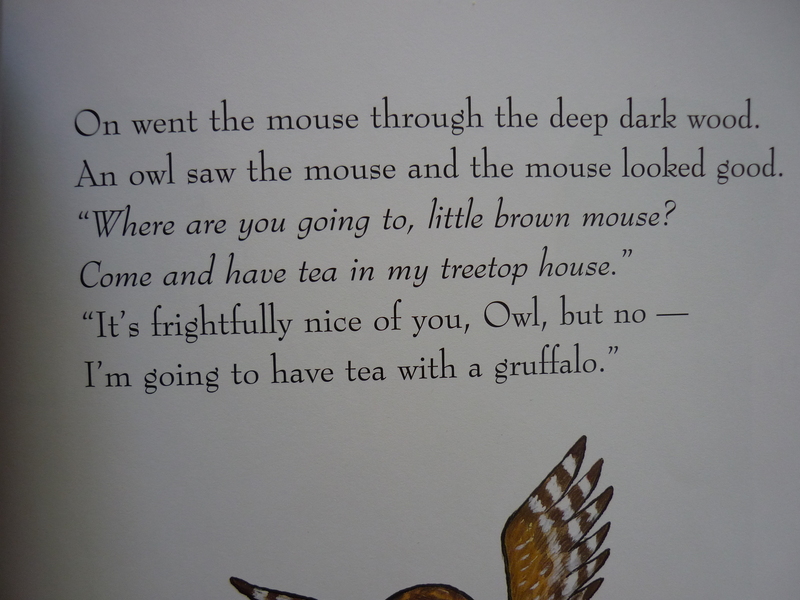 Donaldson, J., 1999, The Gruffalo. London: MacMillan. Tan, S., 2013, The Red Tree. 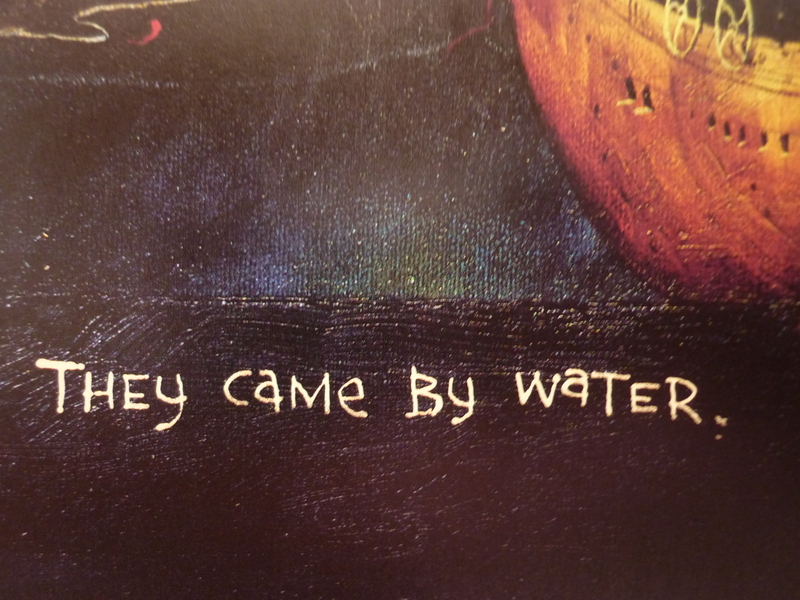 Sydney: A Lothian Children’s Book. Marsden, J., Tan, S., 2012, The Rabbits. 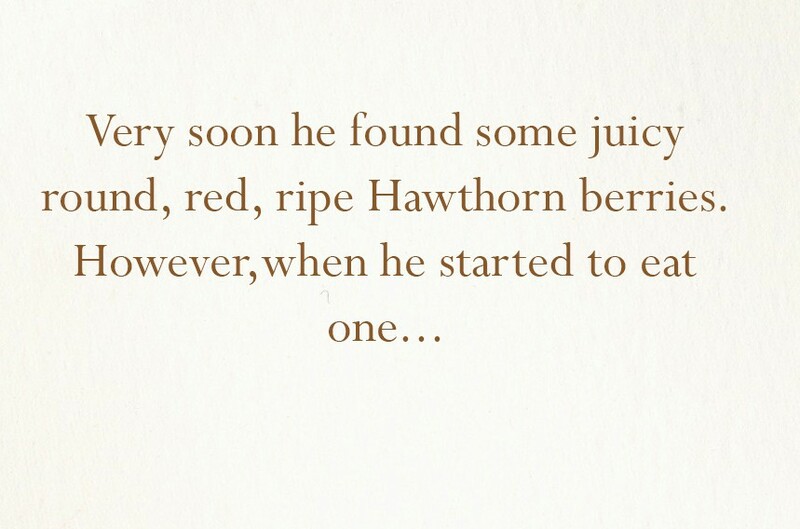 Sydney: A Lothian Children’s Book. This entry was posted in Adding Text. The artists Eric Ravilious and Micael Rosen where mentioned to me and so I thought I would explore their work a little more. I had already heard of Michael Rosen as he is a successful children’s picture book author and illustrator but haven’t heard of Eric Ravilious before. It was said that he used to paint layers upon layers of thin watercolour until the colour was deeper enough. When he used to run out of time to finish the painting, instead of rushing it was claimed he would spend evening making notes about the colour of nature and then return in the day to finish his work. This is very meticulous way of painting compared today where one can take a photo and finish it off wherever they are. 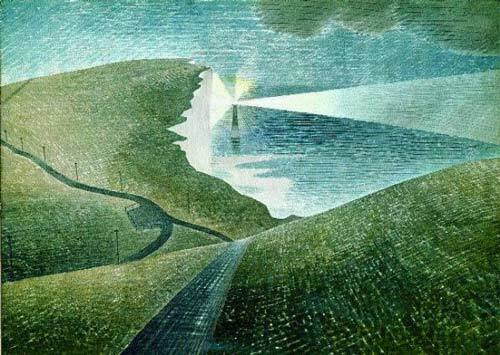 He achieved the texture in the fields by stippling or in other works like the Beachy Head, the sky has faint white strokes which is achieved by delicate scoring of a corner of a razor blade. This is detailed and elaborate illustrations that have had a lot of care and time put towards them. I would love to get to this standard but again I would need more time. However, what I can take from this is, is if I take care in building my layers up when painting then I might be able to achieve some softness in the drawings. Also I am using a different medium to Ravilious but I am starting to use the pastel pencil like a watercolour by using my paint brush on the pencil first instead of putting pencil to paper. To gain some added texture and detail I then use the pencil on paper to achieve a rough texture. I am looking specifically at his book We’re Going on a Bear Hunt. The front cover does not give a lot away, all you know is that these are the main characters which are a family and that they are going on an adventure but you don’t know where, or what they are going to encounter. It is interesting that the pages that have repeating text are in grayscale. This allows the next page to have a dramatic effect when your eyes are flooded with colour and large text describing sounds. Originally I was going to place the Jay’s, Stoat and insects memory in grayscale to show it was a past memory but as the storyline developed I took out a lot of those scenes so it wouldn’t have worked as well as this book. The only word that is repeated throughout is grumble but this works best in bold bright colours. If I were to create another book with sounds I would consider the way Rosen has manipulated the colours to create a bigger impact with every turn of the page. Dramatic woods and interestingly he has made the backdrop darker and the foreground lighter, many illustrations of the woods do the reverse. The text is very prominent in a large box with the illustration as the backdrop. I love this scene! 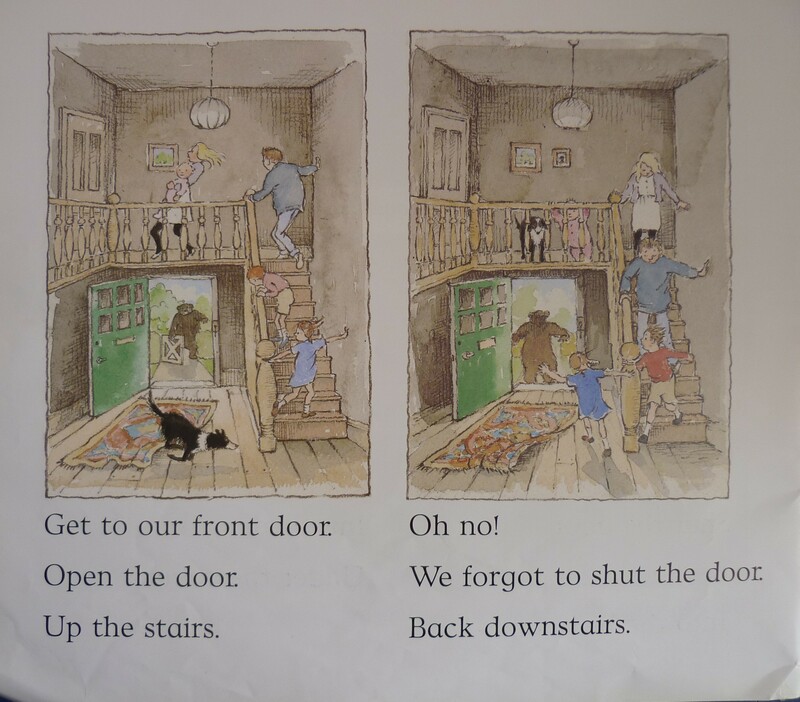 It’s very clever because when telling a story I always assume you have to go forward with the scenes but here he has gone backwards as they have mistakenly left the door wide open. Creating tension as the bear is approaching quickly. A clever concept and it is exactly the same scene but just the characters are changing. You can imagine the gut dropping feeling when they realise and they try and get tot he door as fast as possible to close it. Also I noticed the borders are wobbly similar to my illustrations and it does create more movement in the scenes although they have used a light brown to highlight the box whereas I have left it. It is interesting looking at two completely different styles of illustrations but for my work they interlink nicely. 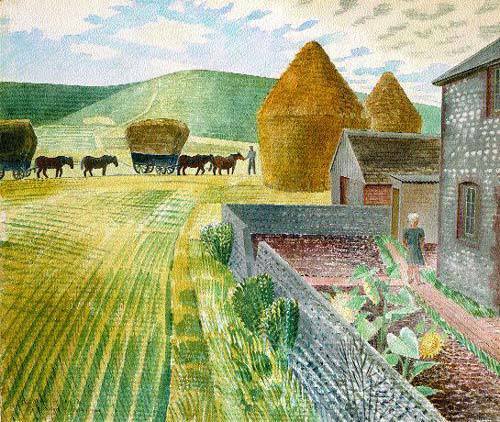 Ravilious’s work shows the depth, softness and texture you can create with building up watercolours. Whereas Rosen shows the movement and flow you can gain from using various techniques to illustrate a story. Both illustrators use a sense of traditional medium allowing the subtle mark making to create the depth and not overcomplicating the scene, which hopefully I will achieve in my own work. 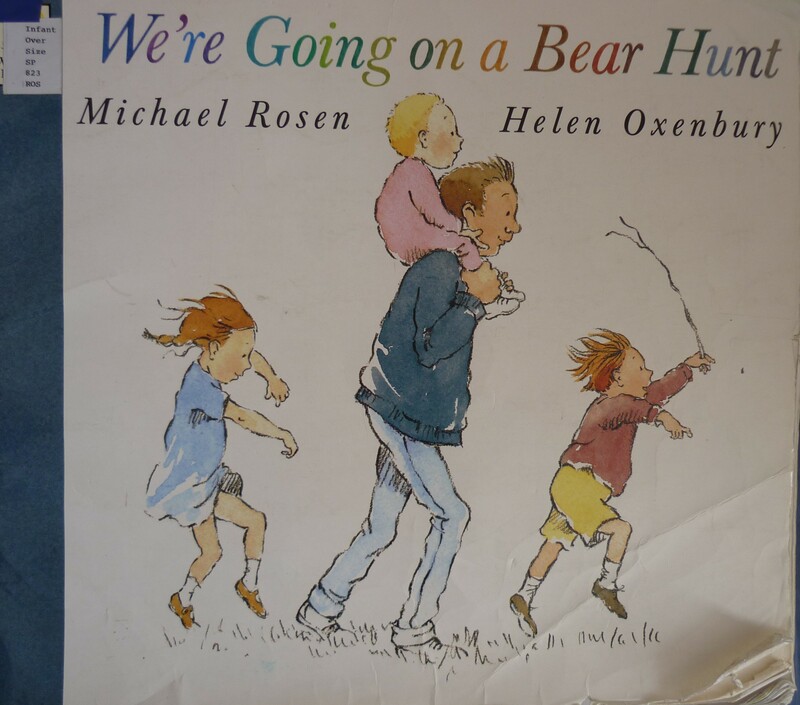 Oxenbury, H., & Rosen, M., 1996, We’re Going on a Bear Hunt. London: Walker Books Ltd.
Ravilious, E., 2011, Research Point: Eric Ravilious (1903-1942). [internet] Available from: https://carpetmoss.wordpress.com/2011/03/02/research-point-eric-ravilious-1903-1942/. [Accessed 18 April 2015, 11.33am]. This entry was posted in Mini artist research. Very rough and sketchy but this helped me a lot, as I could design the images around the storyline and I would create too many pages that I would then have to edit out. Although saying that and I may contradict myself here but in the future when hopefully I will have more time to create a picture book I will have another go at not having a story board. This is because I want to experience creating work with no boundaries and then in the editing process (which has been to short for this term) I will be able to merge ideas together or create better work. This entry was posted in Storyboard.